This still from a NASA video shows astronauts Cady Coleman and Sunita Williams clad in spacesuits and practicing a complex cooling system pump replacement to help astronauts on the International Space Station perform two unexpected spacewalks to actually make the repairs in August 2010. Amalfunctioning pump in a vital cooling system onboard the International SpaceStation sent NASA scrambling to plan two emergency spacewalks this week toreplace the faulty component module. At the center of that planning is a hugeswimming pool in Texas. Butcoordinating unplanned spacewalks, particularly in the face of a system breakdown, is an intricateprocess that requires balancing safety and efficiency. Station managers andengineers on Earth have been working around the clock to develop andchoreograph plans for the two expeditions outside the International Space Station. To plan andpractice the spacewalks, other spacesuit-clad astronauts on Earth rehearse themaneuvers in the Neutral Buoyancy Laboratory, a huge underwater tank at JohnsonSpace Center in Houston. The NBL is immense: It is 202 feet (61.5 meters) long, 102 feet (31meters) wide and 40 feet (12.1 meters) deep. Altogether it holds 6.2 milliongallons of water. Wheelock andCaldwell Dyson will replace a faulty ammonia cooling system pump that shut downlast weekend. The first spacewalk begins Friday at 7 a.m. EDT (1100 GMT). Thesecond will occur Monday. The timingof the emergency spacewalk actually coincides with one that was previouslyplanned, which helped to speed up the planning process, space station flightdirector Courtenay McMillan said in a Monday briefing. Theastronauts were initially scheduled to prepare the Russian Zarya module forfuture robotics work and prepare the space station for future upgrades. Instead, theastronauts will focus on replacing the faulty pump with one of four spare pumpmodules stored on the space station's exterior. AstronautsCatherine "Cady" Coleman and Sunita Williams are conducting sessionsin the NBL to practice the upcoming spacewalks and identify challenges to beaddressed when Wheelock and Caldwell Dyson replace the ammonia pump module. "Wehave crewmembers in the NBL today doing what we call a development run," McMillansaid. "Cady Colemanand Suni Williams were in the pool doing some of the tasks that we foresee onthese two EVAs." Practicingfor spacewalks can sometimes be as tough as the real thing, too. Coleman andWilliams are spending hours clad in spacesuits and submerged in water workingon life-size replicas of space station hardware. NASA's spacewalks typicallylast about 6 1/2 hours during space station maintenance or repairs. It helpsthat NASA has actually prepared for this specific type of pump failure. It isone of 14 major malfunctions the space agency has planned for in advance becauseof its severity. That preparation has helped speed spacewalk repair planning, station managers have said. Still, it'sexpected to be challenging work. 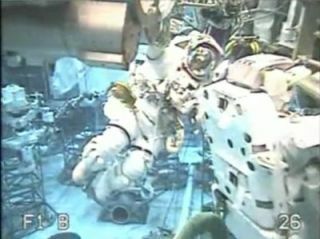 During their spacewalks, Wheelock and CaldwellDyson will have to work together precisely to remove the bulky faulty pumpmodule and install a new one. On Monday,Caldwell Dyson described the ammonia pumps as "gigantic,"comparing their size to that of a laundry dryer box. Each pump weighs 780pounds (353 kg) and is 5 1/2 feet long (69 inches) by 4 feet wide (50 inches).They are about 3 feet tall (36 inches). The faultystation cooling system pump is on a truss segment on the right side of thespace station. Its replacement is attached to a storage shelf about 30 feet (9meters) away. Because of their awkward size, moving the pumps back and forthwill be tricky, McMillan said. Based on theresults of Monday's NBL session, program managers decided to delay the firstspacewalk to Friday, giving the team more time to analyze and refine theengineering requirements of the repair mission. Spacestation managers pushed the start of the first spacewalk a day back from theiroriginal plan, which gives the engineering team more time to coordinate andplan the maneuvers needed to carry out the challenging repair. The twospacewalks are now targeted for Friday and Monday. "Thisis a very aggressive timeline for us to get the procedures ready," McMillansaid. NASAwill broadcast the International Space Station spacewalk repairs live fromspace on NASA TV, with the firstspacewalk slated to begin Friday at 7 a.m. ET (1100 GMT). Click here for space station missionupdates and SPACE.com'sNASA TV feed.